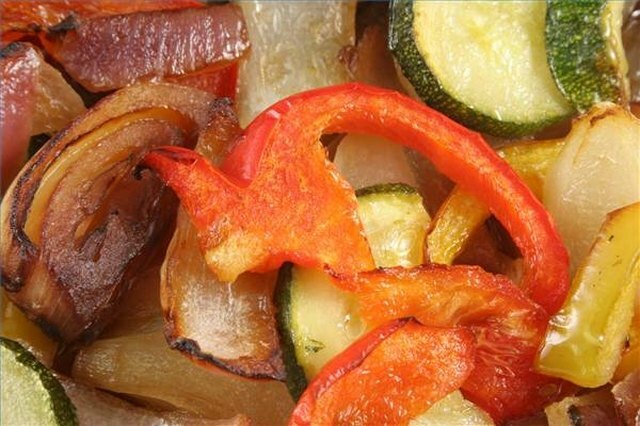 Roasting vegetables at 300 F brings a sweet, full flavor to such vegetables as onions, carrots, squash and asparagus. 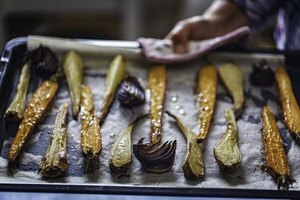 This low temperature allows the more delicate vegetables, such as squash, to roast evenly without quickly turning soft and inedible. The tricks to good roasting are to use just enough oil to cook and flavor the food without drowning it and to know which vegetables roast better in a covered or uncovered pan. Chop up one or more vegetables. A vegetable cut into 1-inch pieces will cook slightly faster than if it is cut into larger 2-inch chunks, so the amount of time you have to prepare the meal may determine how big you want to cut them. Place the vegetables in the roasting pan. Choose a pan size that holds the vegetables fairly snugly but has enough room to allow for thoroughly mixing in oil and spices. Drizzle olive oil or melted butter onto the vegetables. Give them a good coating, but do not let the oil pool up in the roasting pan, which can lead to mushy vegetables. Start with 3 or 4 tablespoons for a small amount of vegetables. Mix the vegetables and the oil thoroughly until all the vegetables have a slight sheen to them. Add salt and pepper to taste, and mix one more time. Cover the roasting pan tightly with a well-fitting lid or aluminum foil. 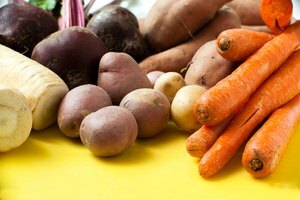 A covered pan works well for root vegetables, such as carrots, onions, potatoes, garlic, turnips and parsnips. These vegetables take longer to cook, so covering the pan allows for higher, more moist heat. 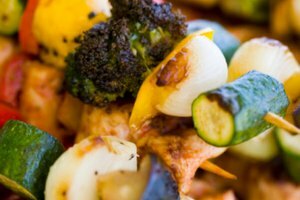 Such vegetables as summer squash and zucchini roast better uncovered; these more delicate vegetables do not need the added moisture of a covered pan, and covering them can cause them to turn into mush. Place the roasting pan in the 300 F oven. Roast a covered pan of root vegetables for at least 1 hour. An uncovered pan of squash or zucchini can be checked after 20 minutes to see if the vegetables are thoroughly cooked. Insert a fork or small knife into the vegetable; if you can easily break through to the middle, it is done cooking. Add fresh herbs, such as rosemary or tarragon, to the oil, salt and pepper before mixing.